When you step into the homes of 28th at Brookwood, you step into a way of life. Their unique style compliments the Buckhead community’s vibrant in-town address. We’re excited to announce the opening of our newly decorated 28th at Brookwood model home. Here you will find Rockhaven’s expert craftsmanship on display. Both the interior and exterior design of the model boast high-end finishes Rockhaven is known for throughout Atlanta. To give you a taste of what awaits you when you tour 28th at Brookwood, here’s a look inside our model home. 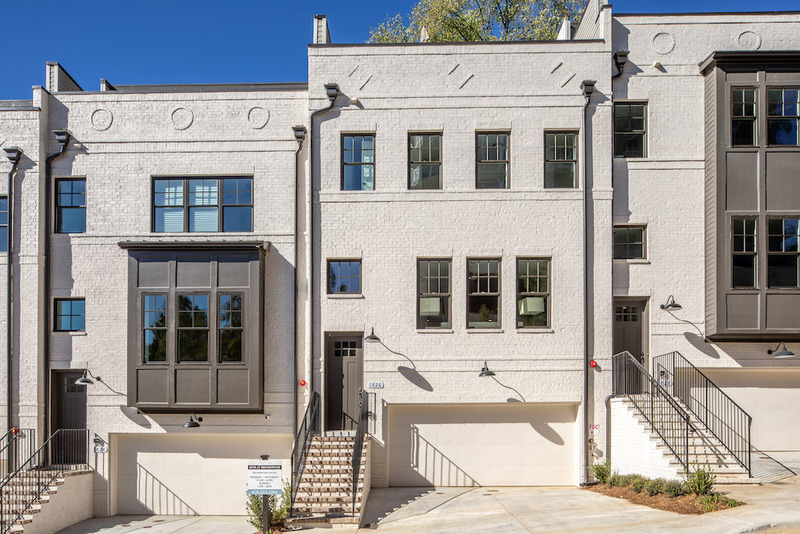 The 4-story townhomes in 28th at Brookwood provide a stylish and functional space for both entertaining and daily living. This gives your family ample space to live comfortably inside and outside your home. 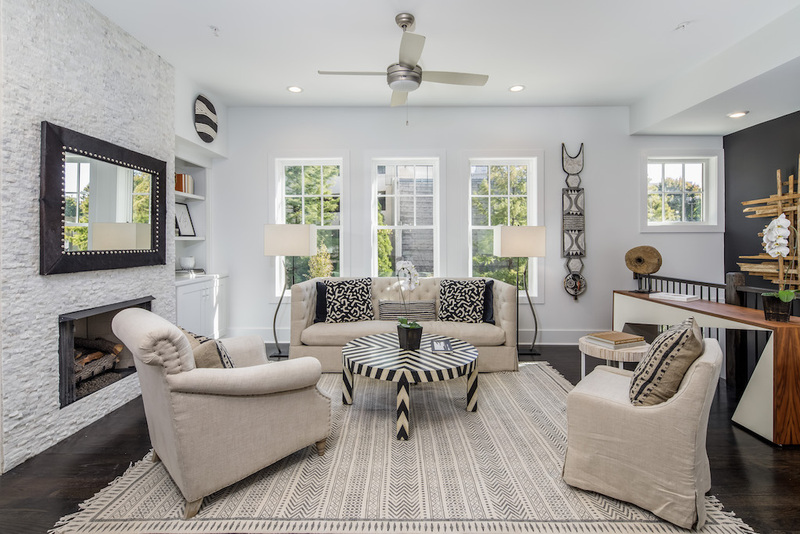 In our newly decorated model, you will find thoughtful design and details throughout. Each room presents a unique style accented by a crisp, neutral color palette that unites every room of the home. 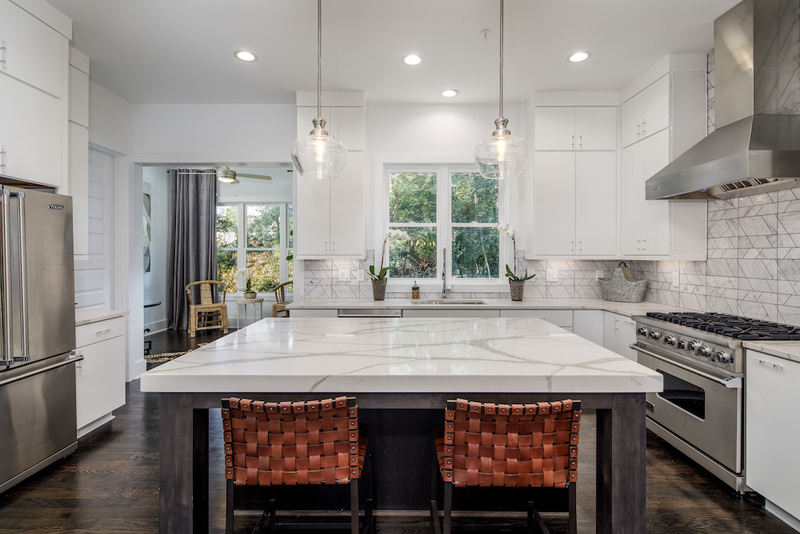 Among these details are the gorgeous light fixtures that fill the entire home with warm inviting light. Plus, the hardwood floors on all levels. They also give it a sense of character that sets it, and other homes in this beautiful neighborhood, apart from mass produced housing. The details don’t stop there. While walking through our newly decorated model home you’ll also find several luxurious finishes. Including, marble countertops in the kitchen and a stonework wall surrounding the fireplace in the living room. Additionally, you will find both artistic tile and carefully crafted built-ins throughout the home. These elements combine to create a chic interior design that’s sure to spark conversation at your next holiday gathering. Whether you choose a townhome or a single-family home, comfort is at the core of the homes in 28th at Brookwood. From the lavish master suites to the tranquil 4th story terrace, each of these homes is built with comfortable living in mind. In our 28th at Brookwood model home, you’ll find oversized master bedrooms with ample space for a sitting area all your own. 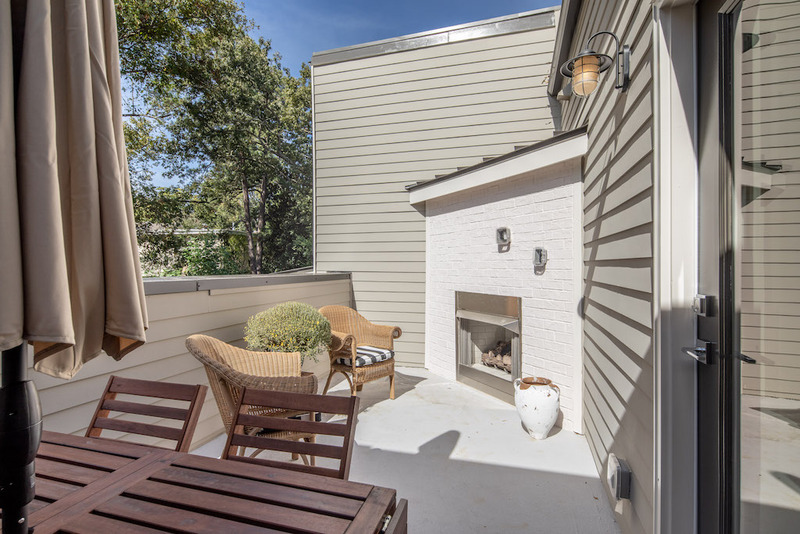 In addition, the outdoor terrace with fireplace gives you the perfect spot to enjoy some relaxing time outdoors by the fire. Ready to see more? From the spa-inspired master bathroom to gorgeous built-ins and a cozy sunroom, there are many more details for you to explore. Contact us today to schedule your tour of the fully decorated model in 28th at Brookwood. Our sales center is open Monday – Saturday from 10am – 5pm, and Sunday from 1pm – 5pm. Get directions now.